Later, the Michter’s brand was resurrected in the late 1990s, with whiskey made in Kentucky. I first wrote about Michter’s 10 Year Single Barrel Kentucky Straight Bourbon in 2009. Today, I look at the 2017 release. This limited and tough-to-find bourbon is released each fall, along with a 10-year rye and, depending on the year, 20- or 25-year bourbon. Ostensibly, it’s the same bourbon; in reality, much has changed. Earlier, Michter’s 10 Year bourbons were known for being excellent picks, including from the stock of Stitzel Weller wheated bourbon that also was the source of earlier Pappy Van Winkle bourbon. While Michter’s has started operating its own distillery, to date all Michter’s 10 Year has been sourced elsewhere. Although the source has never been revealed, it certainly isn’t Stizel Weller anymore. Brown-Forman (Old Forester), Heaven Hill, and Barton’s have all been speculated to be the source(s). Michter’s 10 is bottled at 94.4-proof. The 2017 version retails for around $120, though don’t be surprised to find it selling for even more. The spirit is chestnut brown in color. The nose is an inviting combination of toffee, buttered popcorn, and toasted oak. It has a creamy, velvety texture that features a combination of vanilla, oak, subtle baking spices (cinnamon, nutmeg), and brown sugar notes. 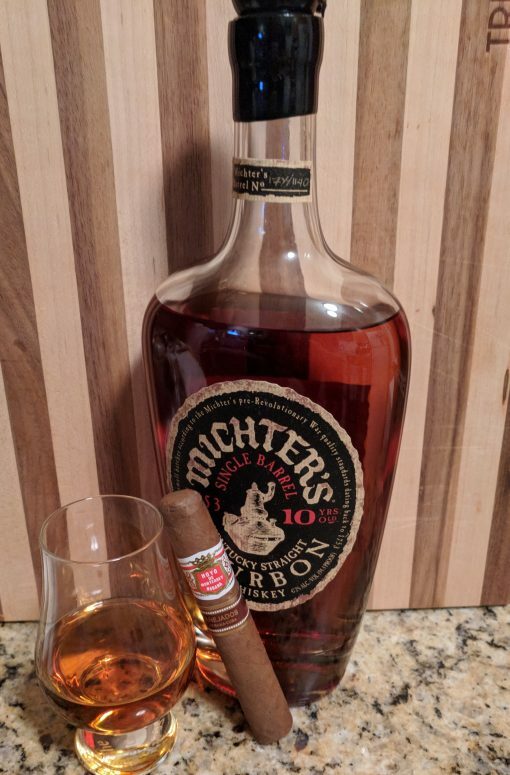 More than anything, the 2017 release of Michter’s 10 Year is smooth. The finish is long with soft wood spices and burnt brown sugar notes. It’s a very tasty bourbon with one significant drawback: a $120+ price tag. Personally, I find it hard to justify this cost when I can easily buy three bottles of very good bourbons—like Eagle Rare 10 Year or Henry McKenna Single Barrel (10 year)—for less, though that doesn’t mean I don’t appreciate this, smooth, flavorful, well-executed bourbon. To fully appreciate Michter’s, you’ll want to pair it with a mild- or medium-bodied cigar that’s well-balanced. Specifically, I’d recommend Cabaiguan, Davidoff Grand Cru, Paul Garmirian Gourmet, or Tesa Vintage Especial.